Experts are exploring whether wearable fitness trackers can improve health during and after cancer treatment. Los Angeles resident Thuy Truong purchased her first wearable fitness tracking device in May 2016, with plans to monitor her steps and sleep patterns during weekly hikes and campouts. She couldn’t anticipate how helpful the device would become four months later when she was diagnosed at age 31 with stage 4 lung cancer. 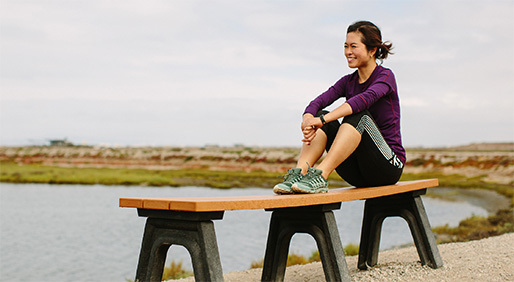 While taking targeted therapy drugs to slow the cancer’s growth and dealing with back pain caused by the cancer’s spread, Truong watched her activity level plummet from 20,000 steps during hikes, to 10,000 average daily steps, to less than 1,000 steps a day. Undaunted, Truong continued to monitor her fitness. “I was able to be more active as the medications took effect, and I got a better handle on the pain,” she says. Truong used the fitness tracker to gauge how her health was improving. “When the device showed that I could manage 1,000 steps a day, I challenged myself to walk a little farther,” she says. Gradually, Truong worked her way up to 10,000 daily steps and is now back to doing longer hikes. Nearly half of Americans own a wearable fitness tracker, or wearable, according to a 2016 PricewaterhouseCoopers consumer survey. Depending on the device, a wearable can monitor your activity level, sleep patterns, heart rate and diet (you log what you eat, and it calculates your calories burned). Wearables haven’t been around for long. A couple of devices for the wrist emerged in 2012, with the first of that type introduced by Fitbit in 2013; the first Apple smartwatch went on the market in 2015. (Of course, the basic step-tracking pedometer has been around for much longer.) Already, researchers are studying whether wearables can improve the health of people with cancer and lower the risk of cancer recurrence. Jorge Nieva, M.D., a lung, head and neck cancer specialist at the University of Southern California Norris Comprehensive Cancer Center in Los Angeles, is co-leading a study called Analytical Technologies to Objectively Measure Human Performance (ATOMHP). Nieva and his fellow researchers are currently analyzing data from the study to determine whether information from certain technology, such as wearables and smartphone apps, can help doctors better tailor cancer treatments to patients. Cancer specialists rely on a tool called the Eastern Cooperative Oncology Group (ECOG) Scale of Performance Status to measure how the disease affects daily life. Doctors rate patients on a scale of 0 (able to do normal activities) to 4 (completely disabled or bedridden). Wearables can help shore up this perception/reality difference by giving health care teams a more accurate idea of exactly how mobile a patient is in real life. A wearer can log into her device’s website or app and bring printouts of her daily, weekly or monthly activity levels to her medical appointments. “This information can improve understanding between doctors and patients, and may lead to better treatment decisions and improved survival rates,” Nieva says. One reason so many Americans sport wearables on their wrists these days is to monitor activity levels. The idea is that the more active you are and the more steps you take the more calories you’ll burn, helping to keep weight off. Because excess weight is a known contributor to cancer cell growth (perhaps due to increased inflammation and hormone production), researchers want to know if technology like wearables can help people keep weight off and lower their risk of cancer recurrence. The Breast Cancer Weight Loss Study (BWEL) is a trial that will test whether taking part in a weight loss program reduces the risk of breast cancer recurrence in women who are overweight or obese when they develop breast cancer. Half of the study participants receive regular diet and exercise advice via phone from a health coach, while the other half receive educational materials, but no coaching. BWEL study participant Marcia Bailey has lost almost 40 pounds in the six months since she enrolled in the study. The Oaks, Pennsylvania, resident was diagnosed with stage 2 breast cancer two years ago, shortly before her 55th birthday. Bailey says the data from her wearable has been eye-opening. “I always thought I walked a lot at my job, so I was surprised to see that instead of hitting 10,000 steps every day, I was only getting about half that amount,” she says. Bailey now uses data from her wearable to push herself to be a little more active every day. “If I’ve had a sedentary day, I’ll grab my husband and tell him we’re going to walk until I hit my activity goal,” she says. At the Houston Methodist Cancer Center, experts are beta-testing the Methodist Hospital Cancer Health Application for smartphones, or MOCHA. The app helps women with breast cancer to monitor and improve in a variety of wellness areas, including fitness, diet, sleep, pain levels and mood. The app sends information to a patient’s health care team, whose members may then send texts to the user congratulating her on achieving an activity goal or reminding her to enter her food intake for the day. Physical activity is also key to maintaining the strength and stamina the body needs to endure treatments and fight cancer. A 2015 study in the Journal of Clinical Oncology found that women with breast cancer who regularly exercised at a low to moderate intensity had less fatigue, nausea and pain while receiving chemotherapy. Other studies of people with colorectal, prostate, ovarian and breast cancers show that physical activity improves survival rates. While the rising popularity of wearables has many people taking literal steps to improve their health, the devices are not without their flaws. Wearables may encourage some people to step it up, but studies suggest the efforts don’t automatically translate to lost pounds or improved health. And like any healthy lifestyle change, using a wearable consistently, and in a way that promotes better health, doesn’t happen easily. A 2016 study in Lancet Diabetes & Endocrinology found that 90 percent of people stop using their wearables after 12 months. Even cash wasn’t enough of an incentive to keep participants interested in using the device. “Only about 1 or 2 percent of people consistently use wearables as health tools,” says Mitesh Patel, M.D., assistant professor of medicine and health care management at the University of Pennsylvania’s Perelman School of Medicine. Patel studies the accuracy and effectiveness of step-tracking devices. His findings suggest that most wearables and smartphone apps are fairly accurate at tracking steps. The technology isn’t as reliable, though, at monitoring heart rate or sleep. In fact, a nationwide class-action lawsuit claims that the heart rate monitoring function of certain Fitbit devices is highly inaccurate. While recovering couch potatoes might not care if these numbers are off, the discrepancy is a big deal to athletes and dedicated fitness buffs who use the information to train and improve competition performance. Conversely, a recent study of seven wristband devices conducted by researchers at Stanford University found that most of the wearables measured heart rate with less than a 5 percent error rate, but that all the trackers were extremely inaccurate when measuring energy expenditure. Before you invest in a somewhat pricey wearable fitness tracker that might not deliver on its promises or that gives you way more data than you can possibly use, Patel suggests first trying the health app that comes installed on most smartphones. In addition to Apple Health (apple. com/ios/health) and Samsung Health (https://health.apps.samsung. com), there also are plenty of free fitness-tracking apps available on iTunes and Google Play. “The information these apps provide is all most of us really need,” says Patel. Of course, you need to keep your phone with you, and not in a separate tote or purse, in order to get an accurate step count.